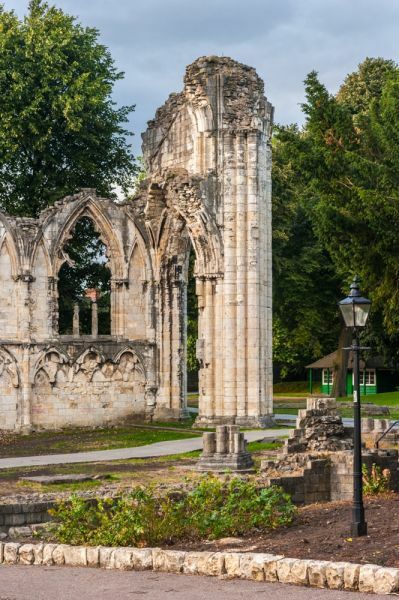 St Mary's Abbey was established in 1088 as a Benedictine monastery, situated on the north bank of the Ouse, inside the city walls of York. 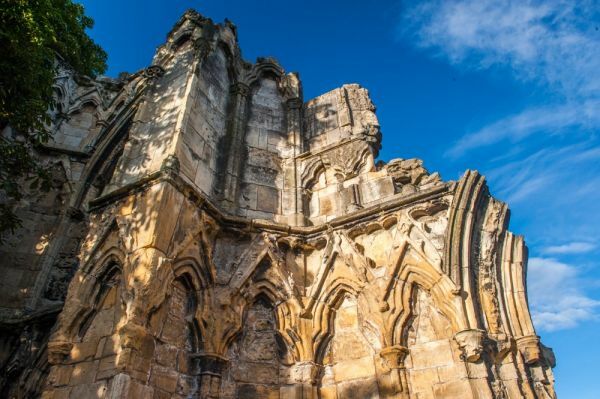 In time it grew to become one of the largest and most powerful monasteries in the north of England. Now only foundation walls of the original Norman buildings remain, in the lovely parkland setting of Museum Gardens. But though the Norman buildings are scant, much still stands of the later 13th-century abbey structures. 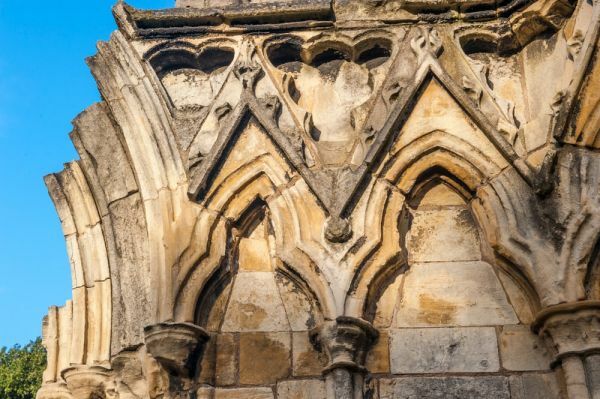 Among these the most impressive is the abbey church, but other buildings still partially or fully extant include the watergate, the Marygate gatehouse to the abbey precinct, and the Hospitium, by the riverside. You might think from its name that the Hospitium was a sort of infirmary, or hospital, but in this case, the name has more to do with 'hospitality', and the building was used by the Abbot of St Mary's to entertain guests. 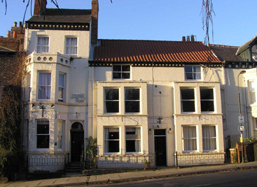 It still fulfils its original function of hospitality, as a centre for the York Museum Trust's hospitality business. 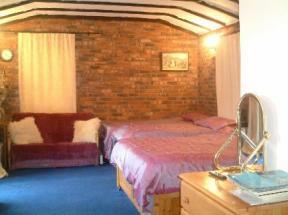 Another part of the abbey complex, the 13th century Abbot's House, is now incorporated into nearby King's Manor. 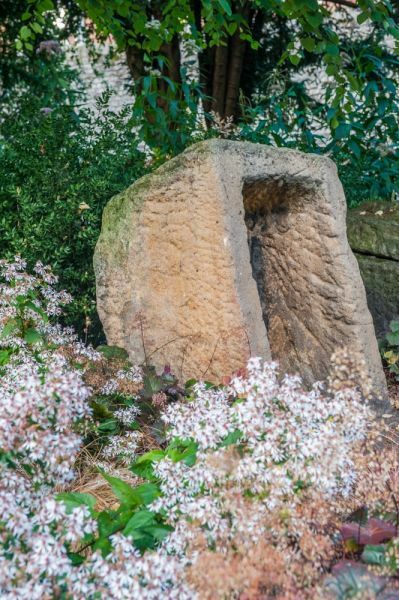 The Yorkshire Museum houses many finds discovered on the Abbey site, including a series of life-sized 12th-century sculptures of saints and prophets, discovered mysteriously buried deep underground. As an interesting historical footnote, notice that the Benedictines chose to establish their monastery in an urban area, in close contact with the outside world. Compare this with the usual practice of the Cistercians, the other great medieval order in Britain, who intentionally established their monasteries in remote areas, far from outside influence. 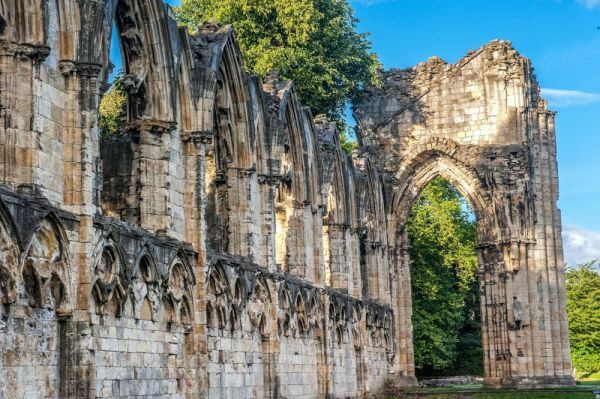 Thus the great Cistercian monasteries in Yorkshire, Rievaulx and Fountains Abbey, were set in remote countryside, while the Benedictines chose to establish themselves close to the seat of power in York. The monks provided a charitable service to the citizens of York, but the relationship between townsfolk and monks was not an easy one. The monks were often criticised for lax application of their monastic vows - even by their fellow monks! Matters came to a head in 1132 when a prior named Richard led 13 monks to demand a stricter application of the Benedictine rule. This touched off a riot among the monks (though there is no indication that physical violence resulted), and as a consequence, Prior Richard and his 13 fellows left St Mary's and the Benedictine Order and established the new Cistercian monastery at Fountains. The affair did not create any great change in the lifestyle at St Mary's Abbey, and the abbey became something of a byword for decadent behaviour, even featuring in an early ballad of Robin Hood, where the rich abbot was Robin's enemy. 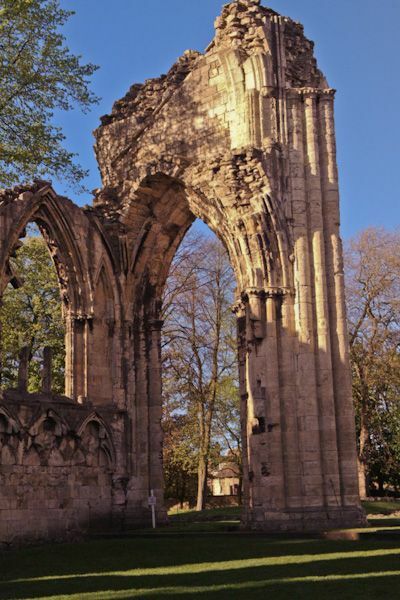 The abbey at its height was composed of 40-60 monks under an Abbot, plus 50 students in the minster school, all supported by lay servants. 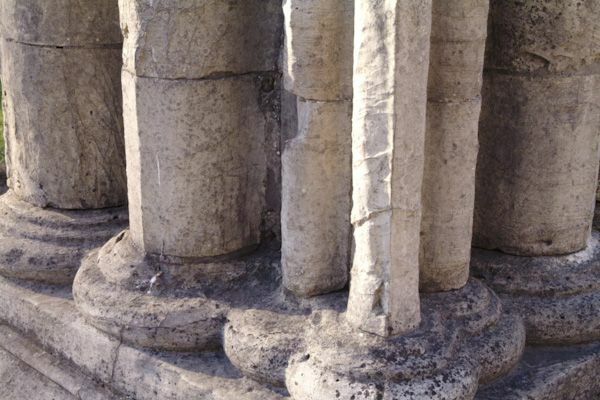 The monks did not simply live a life of meditation - there was work to be done, for the abbey maintained a fish house, brewery, mill, a bakery, granaries, barns, and even a tailor workshop. 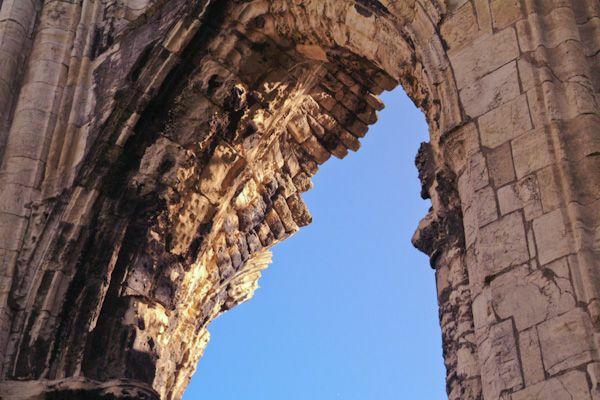 The abbey ruins are close to the line of York's medieval walls, and the Roman wall and Multi-Angular Tower are a short distance to the east. The traditional main access to the abbey precinct is off Marygate, beside St Olave’s Church. 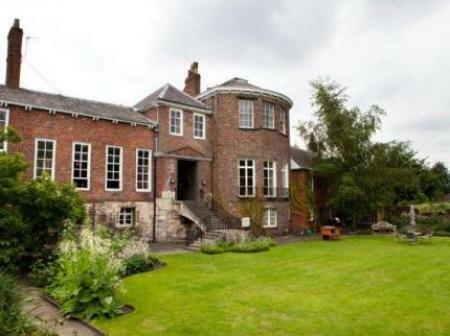 Location: In Museum Gardens, bounded by Museum Street to the east and Marygate to the west. 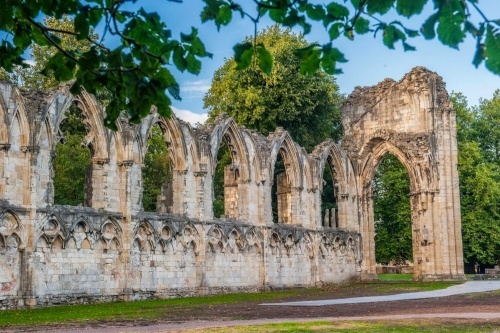 Just head for the Yorkshire Museum and you'll see the abbey ruins!